﻿ Cristiano Ronaldo: "I can't wait for the EURO 2012 to start!" 06.06.2012 » Cristiano Ronaldo: "I can't wait for the EURO 2012 to start!" Cristiano Ronaldo talked with the Spanish sports media "Marca" and couldn't hide his excitement for playing in Poland and Ukraine's EURO 2012. However, a big part of the interview was actually about Real Madrid's matters, which allowed Ronaldo to reaffirm that if it was only up to him, he would sign today a 10-year extension contract with the Spanish champions. This last Sunday, precisely the day after Portugal got defeated against Turkey by 1-3, Cristiano Ronaldo granted an exclusive interview to the Spanish newspaper Marca, revealing his anxiety for the Portuguese debut against Germany and approaching several topics regarding Real Madrid. The Portuguese star reassured that he's truly happy at the club and that if it depended only on him, he would end his career in Real Madrid. Regarding his current form, Ronaldo has no doubts in claiming that he's on the best shape of his life and hence, very optimistic for the EURO 2012. MARCA: Every summer, we end up doing the same question and it seems to be bringing luck. Your season has been once again brutal, with 60 goals in 55 games, improving your stats from last season and being decisive in Real Madrid winning the Spanish League. What can we expect for next season? More goals and an even better season? Cristiano Ronaldo: "I'll try it, that's for sure! I'm going to give my best to do something similar and eventually pull off better numbers. Even if I can't score more goals, I can still try to make more assists for example. It becomes harder every year, but I'll always be looking to improve. I can give you an example: Usain Bolt ran the 100 meters in 9,58 seconds. It's almost impossible for him to beat that mark, but I'm sure he'll be trying it. I'm aware of how difficult things are, but everything is possible." MARCA: This season, you've played near to 4.900 minutes, throughout 55 matches. You've only missed 70 minutes in La Liga. Are you really that tired as one could think when looking at these numbers? Cristiano Ronaldo: "No... However, it's true that it has been a very long season with plenty of games over the last months and some of those were particularly tough mentally. It has been a very intense, demanding and competitive campaign, but I go to this EURO 2012 tremendously motivated and I'm sure I'll be in great physical shape. I can't wait for the EURO 2012 to start!" MARCA: You beat historical marks in Real Madrid, won the most important league in Europe [the Spanish League], ended being the most decisive player in La Liga, etc. Not accounting for what will happen in the EURO 2012, your chances to win the next FIFA Balon d'Or seem to be very high at this stage, don't you think? Cristiano Ronaldo: "Honestly, I'm not very concerned about that, because the most important thing in my mind was to win the Spanish League, which is a title extremely difficult to conquer and probably the most challenging in all Europe. To compete with Barcelona is very demanding and we still managed to end 9 points ahead of them, moreover winning at the Camp Nou. It was an exceptional season, both collectively and individually. As for the Balon d'Or, it's always a very subjective award. I'm not the one voting for it and everyone is entitled to have their own opinion, but I'll be honest about it. I think I'm in a good position to win the award, or at least, to be one of the strongest candidates. I had a great season and I think that not only me but also other Real Madrid players have done enough to be on the nominated list." Cristiano Ronaldo: "That's why I believe I got good chances. I don't want to overthink it, but at the same time, I can't deny that I feel great to know I have good chances to win it, since it's any football player's dream. The FIFA Balon d'Or is the climax for any footballer in an individual level. But like I said, I don't vote for it, so let's wait..."
Cristiano Ronaldo: "I would rather not talk about those matters, because that's something I'm not that well informed about. I'm sure you got a lot more knowledge on those topics than me. The only thing I can say is that I expect it to be fair to everyone, not only for me, but for every player..."
MARCA: "What do you think about José Mourinho's contract extension with Real Madrid until 2016? Cristiano Ronaldo: "Just perfect and I couldn't be more happy about it. A club like Real Madrid needs to have a top coach like José Mourinho. He has to stay with us. It seems clear to me that without Mourinho, Real Madrid wouldn't win as many titles as with him on the bench." Cristiano Ronaldo: "My contract extension? Listen, if it depended exclusively on me, I would stay in Real Madrid until the end of my career. 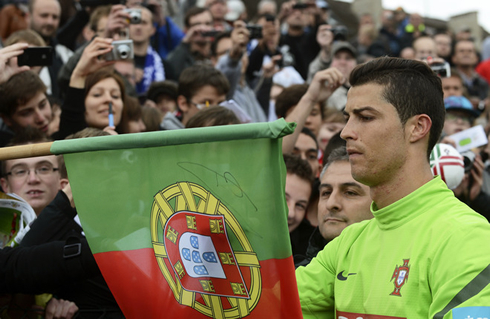 However, I'm not the only one who has a say on this matter..."
Cristiano Ronaldo: "No, no. I'm telling you the truth, you can believe in my words. I'm being honest and I'll say it again while looking in your eyes: I want to end my career in Real Madrid! I want to stay at the club and I would sign an extension for 10 more years right now. However and like I said it before, it's not only up to me." Cristiano Ronaldo: "It's a true honor. Everything I've accomplished so far, was the result of my own sweat, talent, but above all, a lot of dedication and work. I was never given anything for free. Sometimes I can't help to think that I'm still the player responsible for the highest football transfer fee ever paid in the World and therefore, I always try to justify the money that was spent with me, with my work and effort on the pitch." MARCA: After 3 seasons in Spain, does Cristiano understand better Real Madrid or is it the club who now knows you better now? Cristiano Ronaldo: "I'm in the best shape of my life, in a very stable moment both psicologically and physically. I want to keep enjoying these times with the Madridismo in the future, because the truth is that I've felt a higher connection with the fans over the past months. I feel very cherished and loved and that's one of the reasons why I want to stay in Real Madrid for a long time." MARCA: Let's then talk about the Real Madrid fans. Can you tell us what you felt in the day of the ceremonies in the Cibeles, when Iker Casillas put you in front of the crowd who was chanting your name? Do you think that kind of adoration arrived too late? Cristiano Ronaldo: "Sooner or later, the truth always comes out. Did it arrive too late? No problem at all... There weren't many chances before for this kind of celebrations anyway. That's why I'm so happy with our fans and I want them to remain happy by having good performances, goals and assists. I want to show all my love for this jersey and for that to happen, I always have to do my best." MARCA: Not everything was a fairytale though. Before this empathy you created with the Madridismo, there was a crucial moment a few months ago. On January 7 against Granada, when a part of the Bernabéu stadium whistled you and the rest just remained quiet. You seem to have been through some difficult times... How did you really feel? Cristiano Ronaldo: "That may have happened for several reasons and I have to respect it. I may disagree with the reasons, but at the end I always have to respect it. Everyone is free to show what they feel and players should be strong enough to react positively. As far as I know, the same whistling scenario happened with Zidane and Ronaldo [the Brazilian] in Real Madrid and still, they are part of the club's history. I'm not concerned about that anymore. Thank God everyone is backing me up now and for that reason, I'm really happy today." Cristiano Ronaldo: "That happens because Real Madrid is the biggest club in the World. There is a lot of pressure, more people watching the games, more cameras, etc. In every top football player, flaws tend to be looked upon with greater attention. We have to deal with this reality. I'm already used to it even though it isn't easy, but we have to be able of living with it. MARCA: We couldn't help to notice that you have a great bond with Fábio Coentrão. Do you think the Santiago Bernabéu treated your teammate fairly? Cristiano Ronaldo: "No, they were a bit unfair. But these are our fans. Now what happens is that Fábio Coentrão, being a football player with such a big talent and a person with great character, will have to show his true value. The first year is always the hardest one, but he's one of the best defenders in the World. Good players always manage to pull it off." MARCA: Another of your teammates, Kaká, is also going through some rough times. Do you think it would be beneficial for him to leave Real Madrid in order to become that great player he was once? Cristiano Ronaldo: "He has to decide what's best for his future, as well as his family. I can't grant my opinion on what a teammate of mine should do, who above all, is a great friend. I still think he has much to offer to Real Madrid and I'm confident he'll remain with us for a long time. MARCA: The season will start with another Real Madrid vs Barcelona in the Spanish Supercup. Do you finally look at yourselves as being a more powerful side than Barcelona? Cristiano Ronaldo: "What I'm sure about is that we stopped that recent hegemony that Barcelona had achieved. I'm confident that from now on, things will start going our way more often... The players got a lot more confidence and we believe more in ourselves as a team. It will be a good final!" Cristiano Ronaldo: "Yes, it's a tremendous record and almost impossible to achieve. Moreover, I think I was the only player in the Spanish League history to have scored to every single team in just one season. I didn't know about that and it made me really happy. I couldn't be the Pichichi simply because Messi won it, but I still managed to obtain that record of beating every Spanish side in a single season. I became very happy for putting my name in another record for the Spanish football history." MARCA: Can you imagine how it would be like, if you and Messi played together in the same team? MARCA: Do you think it would be a better solution to offer two FIFA Balon d'Ors? Cristiano Ronaldo: "No, one is enough already..."
MARCA: The recent news about Gonzalo Higuaín remaining at the club are the best news Real Madrid could get this Summer? Cristiano Ronaldo: "He's loved by the fans and truly an important player for Real Madrid. Hopefully he'll keep playing for us for many more years. We all want that to happen!" The interview went on for a few more minutes and MARCA is expected to publish some more statements from Ronaldo, this Wednesday. In the meanwhile and now that the EURO 2012 is about to start, we would like to invite you participating in a Facebook game where you can win an iTunes voucher just by competing with your friends! The name of the game is "EURO 2012 Sweepstake" and you can get all the details on its Facebook page here: EURO 2012 Sweepstake.